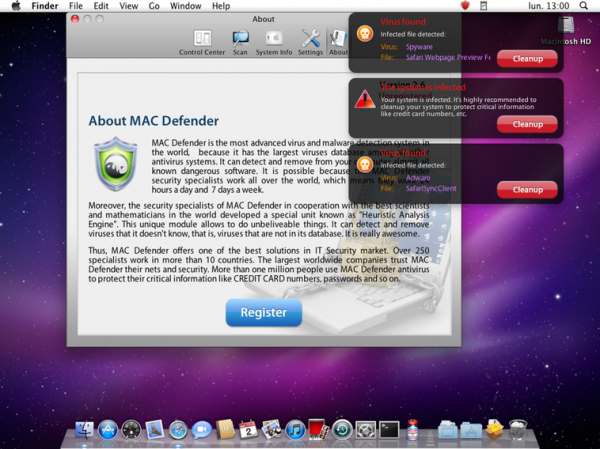 This fake antivirus program called MACDefender, targets Mac users via SEO poisoning attacks, after the user visits particular websites, reports Intego. For long has Windows been the most favored target of malware writers by virtue of its sheer market numbers. But now that Mac useage has crossed the threshold of 10%, it looks like such attacks may become a common thing. In fact a do-it-yourself crime kit for making Mac malware is now also available on the net! In the past, these types of sites only delivered Windows rogue software applications. The fact that such sites are now providing a Mac rogue antivirus must be disconcerting news for Mac users, who believe that they do not have to worry about malware, unlike Windows users. Several Mac users who were infected by the MAC Defender app have posted questions on Apple.com asking how to get rid of the application. Incidentally if anyone is looking for a good free antivirus for Mac, you can check out the one by Sophos. It’s about time these criminals share the love with Mac users. I get so sick of hearing how Mac users (all 10 of them) do not get viruses, malware, etc. As a Windows user, I can say that I haven’t had a virus or malware in 10 years (knock on wood).